Students from The Ellis School celebrate their robot’s victory. According to the National Science Foundation, women make up 46% of the total workforce but hold only 24% of jobs in technical or STEM fields. Engaging girls and young women in STEM early and often is essential to create confidence and competence, and close the gender gap in technical careers such robotics. Engaging girls in STEM is about showing them it isn’t just about numbers or percentages. It’s also about solving problems, helping others, and being creative thinkers. At The Ellis School, an all-girls, independent school in Pittsburgh, PA, for PreK-12, a core part of curricular programming, often within interdisciplinary projects, gives every girl the opportunity to learn to code, build robots, and learn about engineering. These skills are scaffolded throughout the middle and upper schools, and there has been growth in enrollment in robotics and computer science courses in the last three years. Last year, 29% of the graduating class chose a STEM major in college, compared to 15% nationally. Introduction to Computer Science was the second most popular elective in the upper school this year. Ellis also has had more girls than any other school in the region participating in two middle school First Lego League teams and on the Girls of Steel Carnegie Mellon University FIRST Robotics team. Here’s how they did it. The course redesign began with a question— In what ways might we construct an education experience that not only engages girls in STEM, but also equips them to thrive in an increasingly complex future? This question resulted in the transformation of traditional classroom spaces into active classrooms. These spaces encourage girls to work in teams and use design thinking and technology to engage in hands-on learning. The school also renovated a classroom into a CoLaboratory space to encourage prototyping, collaboration, and innovative thinking. In addition to renovating these physical spaces, the school revised curriculum for a number of STEM classes, and the teachers were allowed to flip classroom and homework time. For example, at home girls watch instructional videos made with Google Glass, called LabCasts, to preview labs. When they get to class, they focus entirely on problem-solving and hands-on experiments guided by teachers. In a research study conducted in Ellis’s high school physics class, the active learning approach resulted in significant increases in a few key areas that may keep students interested in studying science. Those areas include relevance and interest in concepts, and not just memorizing equations. “The nature of learning physics is profoundly collaborative at the university level. The fact that these girls experienced physics in a more collaborative way and had a positive attitude toward science content bodes well for increasing their interest and success in physics and other STEM-oriented academic experiences in the future,” said Ellis upper school physics teacher Sam Rauhala. The percentage of students who believe that “learning physics will help me understand situations in my everyday life” increased from 58% to 75%. The percentage of students who expect to understand science conceptually also increased. Prior to this class, 39% said that they disagreed with the statement that they “do not expect to understand equations in an intuitive sense; they just have to be taken as givens.” After the class, the number of students who disagreed with this statement increased to 64%, a change of 25%. There were also significant increases in the value students place on understanding the big ideas behind physics. Prior to this class, only 23% agreed that “big ideas” behind physics concepts were more important than knowing equations. After this class, 41% of students agreed that big ideas were more important, a change of 18%. The Ellis School offers a variety of hands-on learning to get students excited about STEM. Active learning provides context and real-life connections that girls need to be engaged in STEM and gives them more confidence to take further STEM classes or major in STEM subjects in college. Starting in the lower school, girls get hands-on experience with robotics and coding through use of Modular Robotics Cubelets and the iPad app, Kodable, where students learn to code at the same time they are learning to read. Building upon this foundation of problem-solving, critical thinking, and computational thinking skills, the middle school redesigned its computer science courses and incorporated more engineering into its interdisciplinary projects. All students take a required year-long computer science class in both 5th and 6th grades. It’s not uncommon to see girls in the computer lab at lunch or after school, working on their Scratch games. In 6th grade, students leverage what they learn in Scratch and use Snap! to program Hummingbird Robotics Kits. The Hummingbird Robotics Kit is affordable, flexible, and allows students to tell stories through coding, engineering, and art. Hummingbird is also used as a part of several other courses as an interdisciplinary tool for project-based learning in high school classes like Creative Programming and Human Anatomy. Ellis also has two active First Lego League teams that regularly win awards for their creative research projects and robot programming. Last year, Ellis students designed a field communications device to support hotshot firefighters who are often the first line of defense in a forest fire. In the high school’s Introduction to Computer Science, girls learn about code through improv and musical composition. They are supported with tools like Khan Academy and progress forward at their own pace until they come together at the end of the year to code an app or Web-based application to solve a challenge at the school. The Ellis School has leveraged design thinking to help students explore creative problem solving and learn about divergent ways to think. 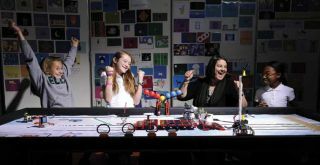 Through programs like Carnegie Mellon University Creative TechNights, FIRST Robotics, in-school assemblies featuring technical women graduates, or participating in the NCWIT Aspirations in Computing Program, Ellis girls interact with many role models. Most recently, the school launched Tinker Squads, a HIVE-funded, all-girl program at the school and three other locations across the city. The program uses design thinking as the framework for girls to identify and solve problems through making something. By working with Invent-abling maker kits, middle school girls are mentored through the making process by high school girls. Ellis students also have the opportunity to visit TechShop Pittsburgh and take classes, network, and create alongside young female entrepreneurs from the Pittsburgh community. Knowing that girls prefer context and connection when engaging in STEM, The Ellis School has leveraged human-centered design and design thinking. These techniques provide a framework across the program to help students explore creative problem-solving, provide opportunities for building empathy around technical problems, and learn about divergent ways to think. Almost every faculty member at the school and several department heads have received training in the LUMA Institute System of Innovating for People. These 36 methods are broken down into looking, understanding, and making methods. They have sparked new thinking and created shared language at the school. The more they have been used, the more the girls have confidence and are open to take risks with what they are learning. For example, instead of learning about environmental sustainability in AP Biology by simply reading a textbook, students determined stakeholders, conducted interviews and observations, and brainstormed ways to be more environmentally sustainable at the school. In middle school, girls used design thinking to learn about sponges and prototyped new sponge designs out of common craft materials. Engineering students designed artificial assistive limbs through a project and partnership with the Quality of Life Technology Center. In many STE M classes where design thinking is used, community partnerships are leveraged to make learning real. The Ellis School has over 25 community partnerships with organizations such as the Pittsburgh Zoo & PPG Aquarium and the Animal Rescue League, to enrich the learning experience. Whether you teach in a single-gender school or a coed classroom, providing role models early and often, as well as making connections to the outside world, are easy tactics to engage students in STEM. Lisa Abel-Palmieri is the Director of Technology & Innovation and Head of Computer Science at The Ellis School in Pittsburgh.